Located on the point of picturesque Napili Bay, the Napili Shores Resort is the perfect blend of budget accommodations in a luxury location. Napili Bay is beautiful half mile long crescent shaped white sand beach with excellent snorkeling. Enjoy sunset strolls and early morning swims. Although not ocean front, the beach is only a 5 min stroll away from the studio and you are only steps from the resorts upper pool and hot tub. Relax and unwind in our garden studio. Wake up to the sound of birds chirping. Enjoy a complimentary coffee from the “Gazebo” Restaurant in the comfort of your own garden patio, surrounded by fragrant plumeria trees. 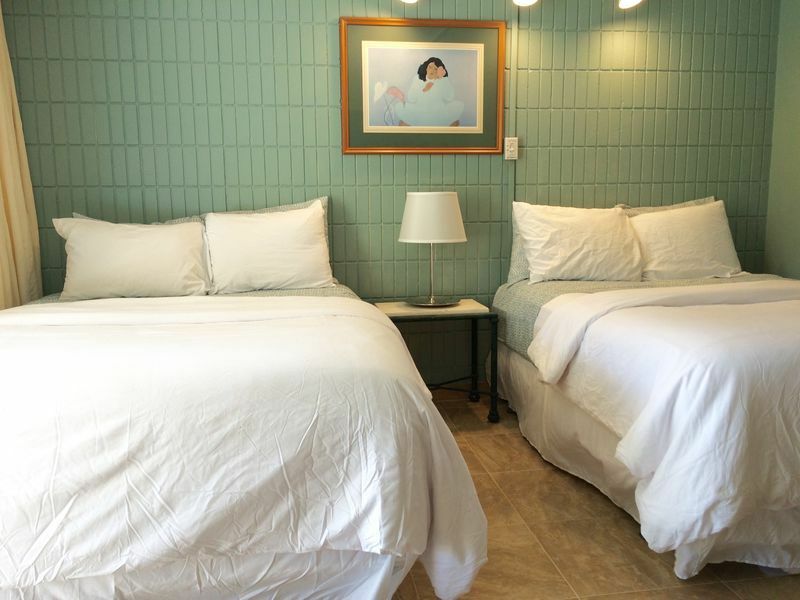 The perfect home in paradise for a small family or friends traveling together, the surprisingly spacious studio can sleep 2-4 guests comfortably in the units two real Queen size beds. No sofa sleeper here! The studio kitchen has everything you need to cook, including full size fridge, oven, and even a dishwasher. Stock up on groceries at Costco on your way from the airport, or keep it flexible and shop at the local Napili Market less than a 3 min drive from the condo. The beach is a quick 5 min walk from the room to the sand. A benefit of being on the ground floor is the ease of walking out the patio doors to through your garden view lanai. You're only steps from the pool, hot tub, and barbecues. Although there is no air conditioning in any of the units at The Napili Shores, we assure you that you won't miss it! Not only do we have standing fans in addition to ceiling fans, but there is the consistent ocean trade winds. If your visiting between the months of November and April, keep your eyes on the ocean for Humpback whale sightings. Often, you can see them playing right off shore in front of the ocean pool. *Beginning 2018 the resort will charge a $75 registration fee to be paid directly to the resort upon check-in and which includes unlimited parking. Napili is a beautiful beach with great snorkeling. It features 2 restaurants walking distance of the area with great ocean view dining. Not only is there the Gazebo restaurant on-site, but the Sea House restaurant on the North end of the beach is just steps from the sand and has lovely sunset views. The more upscale Kapalua resort area is just a short drive on the other side of the bay. with even more dining, shopping, and snorkeling options. If you need advice about activities to beaches or anything in between, simply ask us, and we would be more than happy to help! Please check the calendar for available travel dates. We take pride in keeping our calendar updated. Send us an inquiry or give us a ring and we would be happy to make you a reservation or answer any questions you may have. Fred and Luba started as tourist to Maui themselves. When they first came to Maui in 1995 they stayed in Napili and fell in love with the beach. That is when they used their only daughters college fund to buy a condo on the beach in Maui, and the rest is history! The Napili area is special because they passed a law that no building can exceed the height of the palms trees. This lends itself to the feel of old Hawaii compared to the high rises of Ka'anapali. The Napili Shores resort is also famous for their Gazbo restaurant, which specializes in Macadamia nut pancakes with a killer view. Fred and Luba will be retiring in 2015 and their daughter whose college fund they used all those years ago will be taking over the full time management of their units. Additionally, Leah is on island to assit in case of emergency. Two queen size beds in the studio makes for comfortable sleeping. It's our socializing condo near the pool & jacuzzi and the BBQ area is close enough not to get winded carrying the steaks from the grill. 200 feet over the grassy lawns to the ocean and Napili Bay Beach. We loved staying at Napili Shores. The condo was perfect, we felt at home! We will definitely go back, the location was perfect and atmosphere of Napili Shores made for a relaxing 2 days. The condo had everything we needed and we felt right at home from walking through the door. Thank you very much! We have utilized VRBO rentals at the Napili Shores resort about five times in the last ten years. We have never been disappointed. That being said, we were taken aback upon entering the unit in question. There was a definite musty smell. The unit had not been cleaned very well. The dishes, glasses, and silverware were all in need of washing, the bedding was stained,(mostly the duvets were soiled) and the unit was very dusty. Taking into account the possible dust blowing in from the ongoing renovation of the resort next door, still did not diminish the buildup of dust on many surfaces. The shower curtains had what looked like mold on them. Overall, the unit looked as though it had not had a thorough cleaning in weeks. My wife and I spent approximately one and one half hours straightening the unit up in order to be able to feel welcome. After that was completed, we were able to enjoy the unit, the Napili Shores property, and our stay on Maui. I do NOT wish this to be published on any webpage or publication. Instead, please inform the owners that the present cleaning company is in need of a total review so that others may be able to enjoy there stay in their unit. I send this as constructive criticism so they may improve on the unit in question to maximize their investment. All the staff were amazingly nice and the grounds have the best upkeep I have ever seen. The aloha spirit is amazing at Napili Shores! Can't wait to go back! We just got home from a wonderful week at Napili Shores. Unit D126 was so perfect. Had everything we needed, the owners do a great job providing all the essentials and the room is so comfortable and updated. Felt like home away from home. Highly recommend this unit! Thank you Owners! Our family of three had a fantastic time in this garden studio. The location was perfect for us to play at the beach, snorkel, and swim in the pool. Napili Shores has an onsite equipment rental for beach chairs, umbrella and snorkel gear, which was very convenient. It is also close to a market to restock on supplies. We hope to return! Napili Shores is absolute Paradise! Maui is the closest to Paradise that I have ever experienced!. Stayed at Napili Shores/Outrigger for the second time. Fabulous safe, quiet and gorgeous. Napili Shores and Maui in general, are the perfect place to vacation with the family or to have a quiet, romantic getaway. Great Snorkeling/Diving many species found in Napili Bay Beach and you might even see whales swimming by in the channel. 50% of reservation total is due upon booking as deposit. Balance of reservation is due 45 days prior to your arrival. Cleaning fee of $125 does not include maid service or dishes at time of departure.